Despite accumulating more medical knowledge than any generation before us, heart disease is still the number one killer of adults. A variety of new advances have come about which has enabled doctors to do intricate surgery on hearts and fix them, or even transplant in a new one! Things are being done now which would have been science fiction 50 years ago. But God has been in the heart transplant business for thousands of years! He sent Jesus to “heal the broken hearted” (Luke 4:18). Way back in Ezekiel’s day, God promised that someday He would be performing spiritual heart transplants. Then how do we check on our heart health? How do we know what kind of shape our hearts are in? By the way we hear and receive the Word of God, and by looking to see if it is bearing fruit in our lives. Jesus Christ described different heart conditions in Matthew 13 in He called the Parable of the Sower. Unfortunately, there is a problem with this parable. Actually, the problem is with us. We have heard this parable so many times that there is a tendency to say, “okay, I know this part” and skim over it without digging deeper for more. For there surely is more for us here. So let’s try to take a fresh look at tis parable and find some things to apply to ourselves. I believe that one major mistake we have traditionally made with the parable is to only apply it to those who are hearing the Gospel for the first time. We use it to show why not everyone responds to the salvation message, or to show why they do respond but then fall away. But Jesus does not limit the interpretation to salvation, and neither should we. This parable applies to the heart condition every one of us have on a daily or weekly basis when we read the Word or hear it preached and/or taught! So with that in mind, let’s take a fresh look at the explanation Jesus gives for the symbols and apply them to ourselves instead of others. When anyone hears the word of the kingdom, and does not understand it, then the wicked one comes and snatches away what was sown in his heart. This is he who received seed by the wayside. But he who received the seed on stony places, this is he who hears the word and immediately receives it with joy; yet he has no root in himself, but endures only for a while. For when tribulation or persecution arises because of the word, immediately he stumbles. 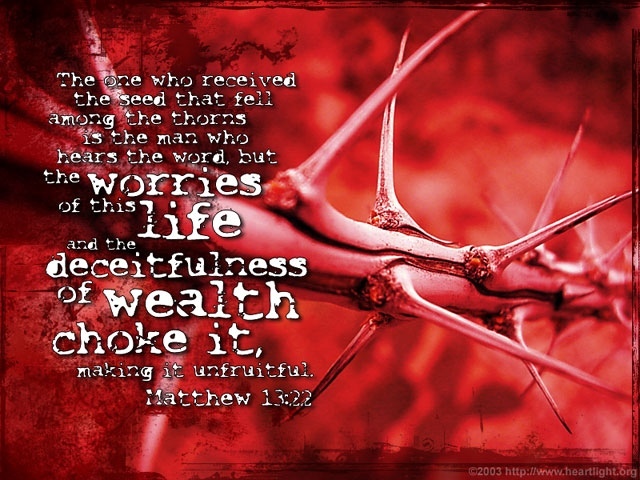 Now he who received seed among the thorns is he who hears the word, and the cares of this world and the deceitfulness of riches choke the word, and he becomes unfruitful. In this short discourse, Jesus reveals the heart conditions of those who hear His message. Hard heart = characterized by the habit of hearing the message but refusing to take it in and apply it to ourselves. Doing this for an extended period may cause you to lose the ability to understand the message and how it applies to you at all. Can you remember the last time a Bible passage or a sermon changed something in your life? If not, or if you do remember and it was awhile ago, you have symptoms of a hard heart. This can only be cured by repentance, so that your heart soil is prepared to have the Word planted in it. Heart Stones = also a dangerous condition. This is caused by not preparing your heart to receive the word by growing deeper in your walk with God. Only by prayer, diligent study of the Word, and the encouragement and fellowship of other believers can we put down deep roots. The more we practice these things, the more the Word becomes a part of us and we do not stumble when trials and tribulation comes. Ever read something in the Bible or heard a truth and said, “that’s okay, but no need to get radical about it”? One big symptom of this condition is a string of enthusiastically learning things, but just trying them out to see if they work instead of totally trusting God and doing what His Word says for us to do. Distracted Heart = also known as spiritual ADD. This happens when we hear or read the Word and say that it is great, but are afraid of what people will think of us if we put it into practice. Or even hearing the truth about something and refusing to change because it might cost us wealth or position if people found out we were sold out to Jesus. A warning sign of this is when you see the truth but the first thought that goes though your mind is, “what would people think if I did that?”. The cure for this condition is the fear of the Lord. Our first thought, upon understanding the truth, should be one of joy at the opportunity to be obedient to God. It should not occur to us to disobey the commandments of God because we love Him more than anything on earth, and even life itself. Healthy Heart = this is characterized by striving to find something about ourselves in every message and Bible reading that we can change to become more like Christ. Or to find something new that we had not known that will equip us to love and serve Him more fully. Results of this condition will be fruitfulness in our walk with God and ever increasing growth in our spiritual lives. So how about it? What kind of soil do you have right now? Does your heart seem to go through different phases of soil quality and preparation? Mine does. Let’s be ever diligent to keep our hearts right, and in so doing keep our lives healthy and our doctrine sound, that we may be fruitful in His Kingdom!